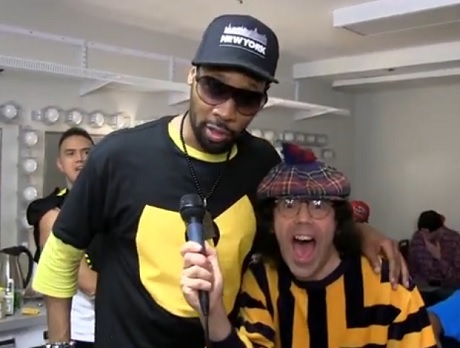 Nardwuar the Human Serviette has been doing a pretty bang-up job over the last couple of decades digging up dirt on a vast array of artists, but according to the Wu-Tang Clan, he's also been doing something wrong since day one. As you'll hear the veteran rap crew tell the tam-topped wonder in a recent gang interview, "you ain't even pimpin' your hat right." The chat took place following the crew's recent Vancouver tour stop, with producer/rapper RZA handling the Lion's share of the discussion. First he uses a good 20 to 30 seconds just rifling off different nicknames for himself ("I got 16 so far"), but Nardwuar switches topics by handing off a series of martial arts film posters. Shaolin vs Lama, Sonny Chiba vehicle Return of the Street Fighter and Duel in the Tiger Den are discussed lovingly, while a crinkly promo poster for 10 Fingers of Death is branded as a bootleg. Also dug up were vintage, pre-Clan singles from Genius and RZA's Prince Rakeem alter ego, with the RZA explaining that they were asked by record labels to do more radio-friendly, R&B-flavoured fare before the bees were let out to swarm. This is one of Nard's longer interviews, clocking in around the 25-minute mark. If you have some time to spare, you can check it out in full down below.